Maryfrances Fabbri: Friday...and its a good day! Friday...and its a good day! Grady and his buddies are here having a playdate before the school bus picks them up. It is raining in MA today so our playdate is all about the Wii. These little guys are so cute. I am sitting here, as I type, watching them jump up and down like crazy nuts. I just love hearing the laugh and giggle. No cares and worries for these three....just want Wii game to play and which Star Wars character to be in the game...don't you just love that. Got a couple more fun layouts to show off. This one is another TT layout I did for CHA Winter. I just LOVE these Loves Me Not Stamps in big and small. Of course it does not hurt that Gail is such a looker...gosh I just love this kid! I stamped one side of the pink cs and then cut out the petal. I think stamped on the other side so when I made the flowers with the folded petals you would see both sides. Added some stickles for a little bling and these flowers came together pretty quickly. 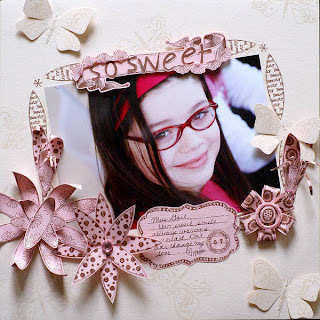 I also used the BoHo Buzz stamps and a pale cream stamp pad to create the background on the cs...totally fun! And if all that was not enough I had to cut out some butterflies also. I am obsessed with cutting things out. It is a great activity for when you are sitting in front of the TV or at one of the kids practices. Here is another one of my layouts. This one is of Grant when he made his first confession back in January. Gregg took him and the camera and got some nice shots of Grant with the priest. He then wrote his act of sorrow and we added that. What a sweet boy he is. Supplies Used... Scenic Route: Sumner Willow http://www.scrapbookeronline.com/store/Scenic-Route-Sumner-Collection-Willow-Street/ Scenic Route: Ashville Family Stickers Prism Card Stock in Brown and Rust Red Fancy Pants Creative Cards: Perfect Pen (Grant's journaling) http://www.scrapbookeronline.com/store/Fancy-Pants-Creative-Cards-Set-The-Perfect-Pen/ Heidi Swapp Journaling Spots: Ledger http://www.scrapbookeronline.com/store/Heidi-Swapp-Journaling-Spots-Ledger-1/ Zig Write Pen in two different browns Cricut George Font,Star, Blessing and It's Your day die cut (Thanks Helen!) Stitching Have a super day ladies! !